Now a proud member of hockey’s Mitten State, I returned to my New England roots this past weekend: waking the echoes of New Hampshire immortal Hobey Baker, dropping by America’s oldest college on the banks of Boston’s Charles River, and turning my hockey homeboys onto Midwest hockey at the other Garden. A century ago, venerable prep school Saint Paul’s of Concord, New Hampshire, was in the midst of a 60-year run as America’s most dominant hockey institution ever. Each of the 350 schoolboys used to played every day on seven rinks (plus two practice rinks) just steps away from the Episcopal spires that united them each morn. Groomed on the legendary black ice of Lower School pond, the SPS preps of the early 20th century frequently beat the best college teams in the country—Yale, Harvard and Princeton—which were stocked with SPS grads. St. Paul’s clearly earned the moniker “Cradle of American Hockey,” and their poster child for dominance on ice was the immortal Hobey Baker. Today the SPS Big Red plays their hockey indoors, and are a just another team in the competitive Independent School League. Their fortunes are currently on the upswing behind second-year coach Dan Murphy, who has them back to their winning ways. St. Paul’s scored a comeback road victory Saturday over Belmont Hill to boost their record to 13-6. The ghost of Hobey must be smiling. Seventy miles south of St. Paul’s, Hobey’s blood rival Harvard enjoyed a crucial weekend sweep of two ECAC foes, including a stirring overtime KO of 10th-ranked Clarkson Friday night. Crimson sophomore Jack Badini of Greenwich, Connecticut, thrust his name into the headlines with two clever goals and a brilliant assist on the OT thriller. A swift skating power forward, Badini skirted the rules to steal an attacking zone faceoff, backhanding the puck to classmate Reilly Walsh, who banged in the goal that helped revive the Crimson’s NCAA tourney hopes. Just. Like. That. Upon entering the Bright Center at 6:55 p.m., a hockey railbird shared a hot tip about a German thoroughbred lining up in the middle of the track, Clarkson junior Nico Sturm. Five minutes later Sturm won the first race and celebrated in the winner’s circle with his 12th goal of the year. I lamented the fact that college hockey is not a betting sport. Look for the 6-foot-3 Sturm to get his chance in “The Show” in short order. His Golden Knights are a favorite to return to the NCAA Tournament this spring, despite their agonizing loss to Harvard. It might be the last time to see Sturm galloping around the icy track as an amateur. A day after the upcoming NFL Super Bowl, college hockey’s premier annual tournament, the Beanpot, commences at the TD Bank Garden in Boston. It might be tough to get Boston’s sporting public, sporting Super Bowl hangovers, off the couch and down to North Station. The tournament, for all its history and tradition, is devolving into just another event on a crowded marquee. Harvard will open against a lackluster BC team in the first game before a mostly empty building at 5 p.m. on Feb. 4, followed by the Northeastern-BU primetime semifinal. My Beantown hockey homeys have a solution to the fading interest in their beloved ’Pot (drum roll please)… Relegation! Yes, relegate the fourth-place team to sit out a year and be replaced by the Minutemen of UMass. There are tons of UMass alums in the Bay Area to help fill the Garden’s glaring gold seats. PLUS, the most boring game in hockey, the 4:30 consolation game on Feb. 11, becomes the season’s most intense, a 60-minute war for Beanpot survival. My buds from Mass might be onto something with this relegation thing. When you say “The Garden” to college hockey insiders, they immediately think BOSTON Garden. Not so fast. Nearing midnight on Saturday my hockey home boys needed a puck dessert before calling it a night, and my host’s TIVO recording device spat out a beauty. The Big Ten had invaded Madison Square Garden, known by New Yawkers as the World’s Most Famous Arena (WMFA). Big Ten Network presented two of the biggest brand names in American sport—Penn State and Michigan—who staged a passionate clash. Every viewer could ID the teams from their iconic helmets: the winged Warriors from Ann Arbor versus the bold striped hustlers from Happy Valley. Both squads had marquee coaches and star players from Team USA’s recent World Junior squad—teammates a week ago, enemies today. Evan Barratt’s transition to college hockey from the World Juniors was seamless, as the Penn State centerman enjoyed a first period befitting a Broadway debut: he wristed in a goal, dished off a tasty helper and was escorted to the penalty box for cross-checking. A week’s worth of ink spilled onto the scoresheet in a single frame. His opposite number in the Maize and Blue, sophomore stud Quinn Hughes, did a helluva Bobby Orr imitation with rink-length rushes and elongated puck touches that defied modern metrics. My Beantown buddies were blown away by the star power from the Midwest. The Big Ten Network production team brought their A-game as well, with a reporter inside the glass eavesdropping on the chirps from former Team USA mates Hughes and Barratt. We also got a live interview with Wolverines head coach Mel Pearson, who gave real answers to legit questions—Yes, Michigan was down two goals, but he wouldn’t change a thing. It was a riveting show, director cuts revealing attractive young hockey fans spilling out from every nook and cranny in the other Garden. 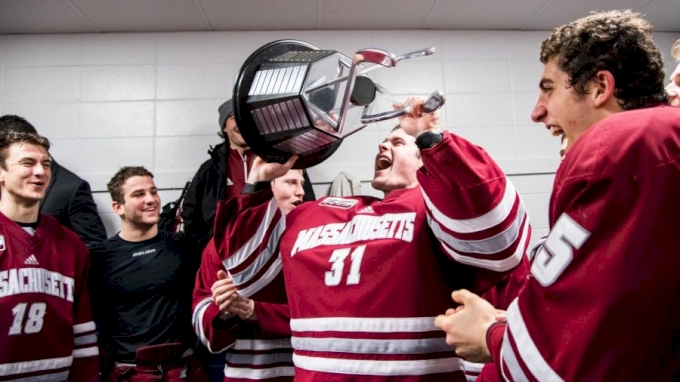 On the ice, we saw a dazzling display of energy and skill from schools that oozed NCAA lore. When my New England puck pals finally shuffled out the door, we shook our heads, buzzing from the injection of Midwest hockey glamor: the sport’s biggest stars, at the “WMFA,” courtesy The Big Ten. Next week, the Beanpot, and Boston’s hockey Garden, would be hard pressed to top that spectacle.